This is the new Basic rebuttal to the myth 'Holistic Management can reverse Climate Change'. There's also an Advanced rebuttal. Applying a new grazing technique on grasslands which have been mismanaged may indeed have positive results in terms of soil carbon storage during the first few years. But the main problem is that storage slows after the initial change, and over a long period of time (such as 50 years), the storage potential of the soil is maximised as it approaches an equilibrium (Nordborg, 2016). This effect is more observable in dry regions of the planet. 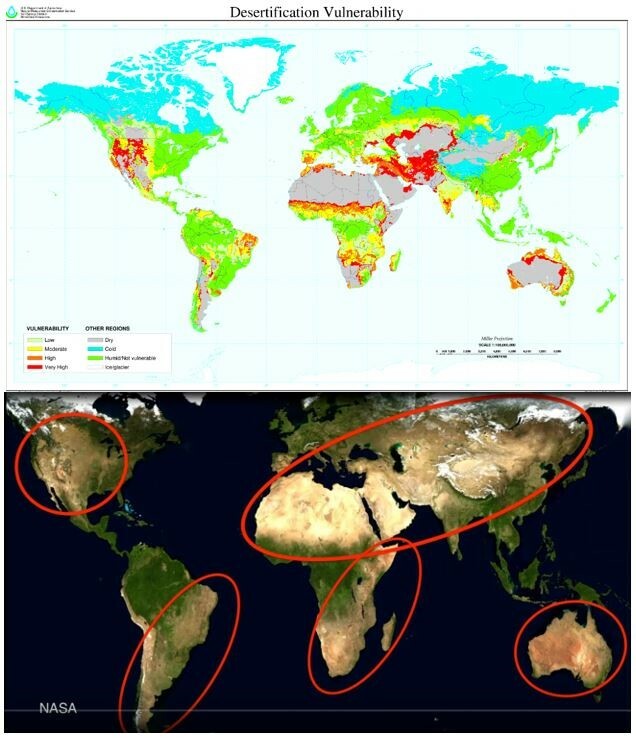 This is because dry regions have lost much of their soil content, therefore having low carbon storage potential. They are at risk of completely drying out because of increasing temperatures and more at risk to the detrimental effect of mismanaged grazing (Lal, 2004).This makes it unreasonable to apply Holistic Management to such dry areas, where the intense grazing would no doubt leave soils further damaged. In fact, one of the principals of Holistic Management - focusing on using the intense hoof action of cattle – has been claimed by the Savory Institute to increase the absorption of water by soils. However, several studies in fact stated that the opposite effect was seen. When comparing land that was not grazed with land that had been managed using a short rotational grazing system (which is very similar to Holistic Management in its ideas), water infiltration was significantly reduced, and the hoof action did not improve incorporation of litter into soil (Dormaar et al. 1989, Holechek et al. 2000). Unaddressed is the interaction between climate and desertification, as in the Amazon where reevaporation infuences the climate futher inland. So it's not just that the dry climate makes the desert, but destroying grassland and forest can also lead to a drier climate. Not saying the critique is not right, just that it seems the interplay should be mentioned. Also, there seems to be some discussion about where the increased methane is coming from, so the attribution to cattle for meat has some margin of uncertainty. Related research from last year: The vast reservoir of carbon stored beneath our feet is entering Earth's atmosphere at an increasing rate, most likely as a result of warming temperatures, suggest observations collected from a variety of the Earth's many ecosystems. "They are at risk of completely drying out because of increasing temperatures and more at risk to the detrimental effect of mismanaged grazing (Lal, 2004).This makes it unreasonable to apply Holistic Management to such dry areas, where the intense grazing would no doubt leave soils further damaged." This is a false demostrably illogical statement. Land that has mismanaged grazing neither proves nor disproves properly managed grazing. It's ridiculous to claim there is no doubt that even using Holistic management would result in the same outcome as mismanaged grazing. It's so ridiculous a statement I shouldn't even need to refute it. But I can easily. As can be seen clearly, Holistic planned grazing significantly increases water content of soils over mismanaged grazing and critically even shows improvement over the control with no grazing at all! Most of the rest of that section has nothing to do with Holistic planned grazing and only describes yet again demostrably mismanaged grazing. We can agree that overgrazing and undergrazing both result in desertification and the release of carbon rather than the sequestration of carbon. Ironically the main reason for the term "holistic" comes from a series of management techniques designed to prevent these sorts of mistakes from happening by closely monitoring and proactive adaptation. Holistic management provides a management framework that dramatically helps prevent these negative results from happening. Simply proving that the land can easily be mismanaged really is not a rebutal of Savory at all. It's more a critique of the status quo Savory is trying to change. Methane is my pet peeve here. I have already discussed this in some detail here. Most of the issue is Natural gas leaks and clathrates, not cows at all. But I would agree that removing the livestock from grazing and instead using feedlots to fatten them also has cause some of the problem. See upland oxic soils is the only biome on the planet that is a net sink for methane primarily due to the action of methanotrophes. Part of maintaining a healthy population of methanotrophes is indeed proper animal impact. Rather than repeat this yet again, I wrote a quora answer off thread you can use as a reference as to why. What reaction can you do to remove methane? So once again it is mismanagement of the land that does have some negative impact, and once again Savory's methods are designed to reduce and/or eliminate these sorts of management mistakes. This is once again not a criticism of Holistic planned grazing, but rather a critique of mismanaged livestock. I would agree that this is part of the problem, but the conclusion of this article is one huge logic fallacy. Just because mismanaged land and livestock is indeed a problem, does not say anything at all about what Savory proposes, nor does it refute the 10's of millions of acres already showing quantifiable improvement due to following his work. That does indeed include published results too by the way. Once again, this time regarding soil carbon, we see marked improvement over mismanaged grazing of several sorts, and critically an improvement over the control of no animals at all. "Because of the complex nature of carbon storage in soils, increasing global temperature, risk of desertification and methane emissions from livestock, it is unlikely that Holistic Management, or any management technique, can reverse climate change." I would agree with that. It's possible but very unlikely. Instead we need to do both fossil fuel reductions and changing agricultural systems both. There is no single silver bullet. And just because fossil fuel reductions is not enough alone, and soil sequestration also probably wouldn't be enough alone, doesn't mean we freeze up and do nothing. It means we must do both! Again with the logic flaws. Astonishing really. "Studies of several grazing techniques and carbon storage have produced no ground-breaking results to suggest that Savory’s idea is doable." This is a demonstrably false statement actually. In fact Savory won the Buckminster Fuller award for proving the breakthrough in rather dramatic fashion. Not to mention repeatability on every continent and the aformentioned 10's of millions of acres already showing dramatic improvement. So this part of the conclusion actually borders on an outright lie. "With increasing temperature, the ability of soil to store carbon will decrease"
Exactly true. And in fact part of the monitoring of Holistic management involves making sure soil temps stay low so they stop losing carbon and water both. So this part of the conclusion yet again can not be assigned to holistic management, but rather mismanagement. The logic flaws continue. "and grazing will likely speed up the process of desertification. " Again the logic flaw. Is this mismanaged grazing? Then the statement is true. Is this properly managed grazing? Then demostrably false. See above. "Finally, methane emissions from cattle are currently too high, and their effect on global warming cannot be ignored." Actually methane emissions mean nothing. this is as false as the merchant of doubt argument regarding CO2 emissions from animals. see argument # 34 for more information. When calculating these, of which methane is but a small part, the entire biological cycle must be considered, not just emissions. Thus it is the net that matters not gross emissions like when we deal with fossil fuels including fossil methane. "Adding more livestock to the planet will not help this." Alone no. Of course not. The thing that mitigates AGW is increasing our depleted biological systems, and livestock can indeed be a tool for doing that, as Savory so amazingly proved on many millions of acres across the globe. Mismanaged livestock are part of the problem now. Not nearly as big a part as the plow and agrochemicals, but a part yes. Especially when the plow and agrochemicals are used to raise grains for cows and sheep, which is ridiculous mismanagement even worse than mismanaged grazing. So we can easily start there and stop this wasteful use of land to grow excess grains. That will free up so much land we indeed might need to uncrease either livestock or wild herbivores just to keep it all pruned properly. To avoid it going to desert like so much is already doing now. However, that is determined later by how much arable land we can take out of production and rest. Got the horse before the cart on that one. In total this basic rebuttal is not very convincing at all. I will work on the advanced rebuttal next to see if it is any better. "Most of the issue is Natural gas leaks and clathrates"
What's your evidence for your claim about clathrates? Clathrates melting are a hypothesis and mostly controversial outcome from oceans warming beyond the range they are stable. While there are fossil methane releases from arctic waters, most of these are actually thought to be methane released from melting permafrost rather than clathrates. The key of course not being any chemical difference, but rather how long the Methane was outside the short term carbon cycle. Is it new? or fossil? That's what matters. So your claim about clathrates being part of "most of the issue" lacks foundation. It's controversial. Sorry for the lack of clarity on a side issue. Methane being part of the natural short biological cycles is not part of anthropogenic climate change. This includes all methane releases from termites and other insects, decaying compost and leaf litter on forest floors, the normal rate it bubbles from peat boggs and swamps, and yes, this includes ruminates. When discussing why the methane is increasing, the need is to show a changed increase over the natural cycle. Most of this is natural gas leaks. There is also a component that is a reinforcing feedback. Melting clathrates and permafrost releases fit that description. There is bubbling methane increasing in the arctic. That is well established. How much it is increased above what would be expected as natural increases and from what source is somewhat controversial. I am actually of the opinion most of it is from melting permafrost. However, what ever % is clathrates and what % is from melting permafrost, or whatever % is from Natural gas, all these are fossil methane, and thus NOT part of the normal methane cycle. Whereas a cow grazing on a properly managed grassland actually reduces net methane because of the action of methanotrophs in the grassland soils when properly managed. "Melting clathrates and permafrost releases fit that description. There is bubbling methane increasing in the arctic. That is well established. How much it is increased above what would be expected as natural increases and from what source is somewhat controversial. I am actually of the opinion most of it is from melting permafrost"
So you continue to speculate. Understood. As to sources of the recent rise in atmospheric fraction of methane, it seems to be sourced primarily from the tropics and mid-latitudes, mostly from natural sources and a small but non-zero contribution from fugitive emissions from fracking and agriculture. "The rise in atmospheric methane (CH4), which began in 2007, accelerated in the past four years. The growth has been worldwide, especially in the tropics and northern mid‐latitudes. With the rise has come a shift in the carbon isotope ratio of the methane. The causes of the rise are not fully understood, and may include increased emissions and perhaps a decline in the destruction of methane in the air." I have found that if I take a long time to write a response I time out of Skeptical Science and when I post the response it disappears. The screen on my computer does not indicate when I time out. If you know a response will be long you can write it in Word and then copy paste it so that it does not get lost. You can also copy a post in the SkS box so that if it disappears you have a copy. RedBaron would make his argument coherent if he would not confuse false statements with invalid inferences. Statements are false, true or meaningless. Arguments and inferences are valid or invalid, i.e., logical or illogical. All bodies that reflect light are made of green cheese. Therefore, the moon is made of green cheese. RedBaron has not shown any logical flaws in the article he is crticizing. Perhaps he is correct in saying there are false claims in the article but he throws around the term 'logic flaw' without any understanding of the term. I have no idea where you learned logic, but your false premise is not the logic flaw I pointed out from rebuttal. The premise, "They are at risk of completely drying out because of increasing temperatures and more at risk to the detrimental effect of mismanaged grazing (Lal, 2004)." is actually true. It is not a false premise like your green cheese analogy. The logic flaw is in claiming that because this true statement of fact, thus the second part, "This makes it unreasonable to apply Holistic Management to such dry areas, where the intense grazing would no doubt leave soils further damaged." Hi RB. We're keen to make this rebuttal as representative of the peer reviewed literature as possible. I've contacted Seb, however term has just ended here, so I am not sure if he is available. I'd like to give him a couple of days to respond, otherwise I'll try and comment. He reviewed I think more than 50 papers on this topic, I'm afraid I've only read only a handful, so we will probably have to wait for his input. "There are large potential benefits in dietary change (e.g., Ritchie et al., 2018), especially reduction in intense factory farming of cattle, but the net cut in methane emission from taking pastureland out of food production is not easily quantified. Replacing organic beef from rocky Scottish hills with soya grown intensively on former tropical rainforest or cerrado is not necessarily advantageous." However, they fall short of firmly taking a stand here. The lectures on methane and CO2 sequestration given by the USDA-SARE for farmers that I have attended says it quite a bit more firmly. Although the USDA conclusions are often only based on ongoing case studies and soil sample data rather than peer reviewed journal publishing. Red Baron, you have claimed on several occasions that improved grazing and soil management can sequester an additional 5- 20 tonnes carbon / hectare / year. This would seem to be a key issue. The article mentions 3 tonnes / hecate / year. Can you please provide details of your claim. I don't really want a list of research papers to wade through because we are talking hundreds of pages. Can you please provide the name of the research paper, and copy and paste of the relevant text to substantiate your claim, and your commentary on it if you want. Might actually help if you understood what holistic management is before you critique it. Hint: It isn't short duration or rotational grazing. Might also help if you referenced more current soil science. Carbon sequestration, utilztion and sequestration is driven by photosynthesis, plant diversity and soil biology. The more soil biology, and specifically arbuscular mycorrhizal fungi (especially relative to bacteria), the more carbon capture and utilzation. Soil microbial science has had a major paradigm shift since more new metagenomic tools have been developed to gene microbial DNA. Sadly your paper references a lot of soil science pre-paradigm shift that doesn't account for the roll of soil microbiology, which pretty much drives everything including the carbon, nitrogen and water cycles (1,Paul et al 2018). The carbon saturation argument fails to acknowledge that via photosynthesis and the MCP more soil is formed. Soil too is formed from the top via decomposition and from the bottom (a-b horizon) via microbial necromass (6. Kallenbach et al 2016). As long as photosynthesis is occuring with diverse plant feeding microbes those microbes die and form more soil organic matter (SOM). More SOM contains more soil organic carbon (SOC) . So soil may reach equilibrium, but more soil is always accumulating from the top and bottom that can capture more carbon. The key for this to occur is to keep root mass in the soil. This is where grazing management comes into play. Contrary to what you wrote, holistic management and short duration grazing are NOT the same thing. Nordborg relies on Briske and Holechek both of whom looked at short duration grazing systems. Holistic Management is actually a comprehensive system to evaluate land to determine goals and paths for both ecosystem and economic restoration that may or may not involve holistic grazing based on the appropriateness of cattle (or other ruminants) in that ecosystem. So, it helps to actually understand what one is critiquing before actually makes a critique or relying on others' critiques. Dr. Richard Teague also wrote a response to the critique of Briske called "Deficiencies in the Briske et al rebuttal of the Savory method" (6). In this response Teague also notes that Briske is comparing grazing systems and doesn't seem to understand what holistic management is. Now holistic management that includes holistic grazing, unlike short duration or rotational grazing, isn't a prescribed system. When cattle or other ruminants are moved, they are monitored and not allowed to eat more than half the forage. Why half? Because anything more than half drastically reduces the amount of root mass. When root mass is maintain, the microbial carbon pump is also maintained, thus carbon exudates are continuously pumped into the soil. Extra plant growth not consumed is trampled down where that forage decompose and becomes part of the decompostion pathway and providing valaublae ground cover which reduces evaporation. 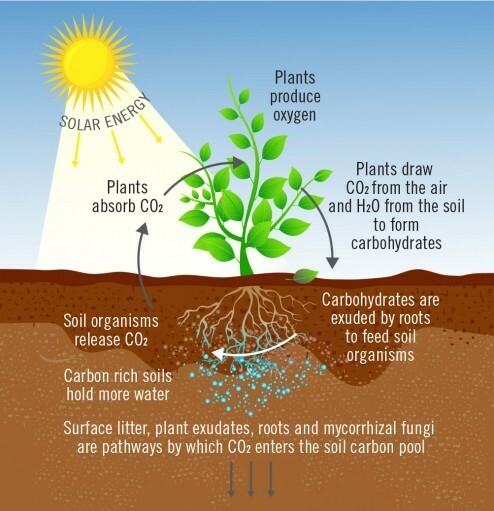 The carbon pumped into the soil also improves the soil structure, allowing for more water to infiltrate and be retained, and ths allow for more plant growth. The area just grazed may not be regrazed for anywhere up to six months to a year depending on regrowth of plants. Again this is closely monitored , and animal movement is based on 'reading the land" through careful observation...again NOT a prescriptive system like SDG or rotational grazing. Now as for methane, using your logic, we should drain all the remaining wetlands and peat bogs plus kill all beavers since wetlands emit copious amounts of biogenic methane as do beaver ponds. Now the argument as to whether there were or were not more wild ruminants is a silly one since there's no real real accounting to prove either side. In North America, we have guestimates of bison, elk, pronghorn, moose, deer, big horn sheep, etc population that may or may not exceed current domesticated populations of domesitcated ruminants both in number and in mass. In Asia and Europe, the ecological memory is much more distant since the large herds of auroch, bison, stepped bison, irish elk, etc were exterpated a much much longer time ago. What's much easier to argument is that we had much greater regions of wetlands than we do have today as well as a lot more beavers making ponds full of methanogens making methane. Microbial, thermogenic and pyrogenic methane comes from a multitude of places like cockroaches, shellfish, coal bed gas, fracking, centipedes, burning biomass, decomposing organic mass, landfills, etc. Despite all of these emissions, the vast majority of this methane is oxidized by hydroxyl radicals in the troposphere (and to a lesser exent in the stratosphere). A small amount is oxidized by methanotrophs in the soil. The geosink though is very small. Due to hydroxyl radical oxidation, enteric and most other forms of microbial methane really are part of the carbon cycle so it's a constant amount. CO2 from the atmosphere is converted to sugars plant use to make cellulose, lignan and exudates. Cattle eat the cellulose. A quorum of bacteria/archae including methanogens in the rumen convert that cellulose to H2, short chained fatty acids and CH4. The SFCA's are used for energy, and the CH4 is burped. That CH4 collides with OH (hydroxyl radicals) which steals a hydrogen atom and thus breaks down to H2O and eventually back to Co2 which again then goes to photosynthesis to make the grasses and twigs cattle and other ruminants eat. It's a cycle ...loop. ...not an aggregating process. If cattle or ruminants don't eat the grasses, those grasses still oxidize or decompose back to CO2 directly or to CH4 which then is oxidized in the geosphere by methanotrophs or the troposphere by hydroxyl radicals back to CO2 which then also cycles. Or, in other words, enteric methane from ruminants and other microbial sources is part of respiration. It's just a few extra steps from CO2 to cellulose to CH4 back to CO2 back to cellulose. So these sources of CH4 are not what are causing methane levels to rise again after 2007. What is? Natural gas from fracking which confused some researchers in their top down analysis becuause fracked gas has a C12 isotope signature. (Thermogenic -fossil fuel- methane sources typically have only C13 heavier isotope signatures). So if you really want to reduce methane levels, switch electrical generation to green energy ...and get rid of fracked natural gas and coal generation of electricity. Anyway, sorry got lazy with my references in the second half of this response. My references ofr methane include Prinn, Rigby, Howarth, etc. You are asking for a copy paste? regenerative management of between –2 and –4 t C ha–1 y–1 (–0.89 and –1.78 tn C ac–1 yr–1) compared to current management alternatives so we calculate GHG emission mitigation by regenerative, conservation grazing and cropping at –3 t C ha–1 y–1 (–1.2 tn C ac–1 yr–1; figures 1 and 2)"
To convert that to CO2e we multiply by 44/12 or 3.67 so just to clean this formatting and scale up a bit for comparison we get 11 tonnes CO2e/ha/yr on average. That is dead center of what was reported by Dr Jones or 5-20 tonnes CO2e/ha/yr on average. You can go right down the list actually. You can find much smaller and larger too. What this rebuttal claims is impossible has been done and measured repeatedly. These are conservative numbers for many holistic managed agricultural systems. Some people are at the low end and some have exceeded even these rates. But it certainly has been proven it is possible, since it has been done and repeated. There are more but I really don't like copy pasting cherry picks of papers that include much more information regarding when, where and why these sorts of carbon sequestration rates can be found and what methods succeed where others fail. Like everything else, the devil is in the details. Carbon farming could be described as knowledge intensive farming. A farmer really does need to understand how this functions and frequently monitor and apply this to adapt to changing conditions in order to get these results. That really is the secret to Holistic management. It really isn't just some prescribed grazing plan. That's just a superficial resemblance. In fact in my personal research animal impact is only optional and currently not even used. But most importantly from my view is the biophysical possibilty is proven. Next it is up to people like me to find ways to integrate this biophysical knowledge into a system that works in context with our own abilities and facilities, goals and community. This is the context in which HM has meaning. Red Baron @13, thanks. I'm a bit relentless at getting to the bottom of things, please excuse me. My impression is as follows.The Nordburg calculations (under the advanced tab) are that improved grazing systems could sequester an additional 3.8 tonnes carbon / hectare / year, and well short of the claims by Savory. The Nordberg calculation seems to be based on 10% of this carbon content actually go into soil carbon and declining over time. The Teague et alia paper you quote appears to say properly managed grazing can sequester an additional 4 tonnes carbon / hectare / year and all of this in the soil itself. This would be a lot more promising than the Nordberg result, but I'm not sure if I have understood Teague correctly. I'm not a soils expert by a long way. I would appreciate a comment from the experts, particularly the writer of the article as to the Teague paper. The general impression I get is soils could sequester significant carbon but short of what Savory claims. I discussed this with Dr. Teague myself in person last year, as he was kind enough to visit here in Oklahoma and make a presentation to the State soil conservation society. I can very confidently reply that you have this wrong actually. Teague told me that actually we can sequester much more carbon than Savory claimed in his famous TedTalk. What Nordborg calls (NPP) and what Jones calls fixed carbon is the same. Net Primary Productivity (NPP), or the production of plant biomass, is equal to all of the carbon taken up by the vegetation through photosynthesis (called Gross Primary Production or GPP) minus the carbon that is lost to respiration. Here is a simple guide for students on how to calculate NPP and convert it to CO2e fixed. None of this is soil yet. What we have at this stage is sugars and proteins that flow as sap and become either root exudates to feed soil microbial colonies, or flows to other plant tissues to become plant biomass. In essense then NPP becomes live biomass. This is fixed carbon. Later this carbon becomes via, one pathway or the other, dead biomass. At this point it can start to become part of the soil stored carbon. The O-Horizon in the soil is almost all decaying biomass and the biology that recycles dead biomass, Saprophytes. A small % eventually can become soil. Labile carbon is the fraction of dead biomass in the soil that eventually decomposes into CO2, CH4 and trace minerals. Stable carbon is the fraction of the dead biomass in the soil that turns into stable humic polymers tightly bound to the soil mineral substrate. Only this last fraction of Stable carbon can be considered Sequestered for the purposes of AGW mitigation. Jones claims 30-40% of fixed carbon becomes root exudates feeding AMF which then produce glomalin, a soil glue. She further claims to have measured a stable fraction to labile fraction for this pathway of 78% sequestered carbon. She doesn't count O-horizon carbon at all assigning it nearly 0% stable fraction, assuming nearly all of it eventually returns to the atmosphere as CO2 or CH4. Teague and Jones are generally in agreement regarding soil function. He told me this personally when we met. I asked directly. Nordborg assigns an astonishingly high maximum potential of 10% stable fraction of soil carbon from the O-horizon as sequestered and completely ignores the LCP entirely. It's not even in the calculations. Holistic management isn't something one can really understand by reading papers on a computer screen, especially when one relies on papers that don't know the difference between holistic management and short duration grazing [SDG] or rotational grazing [RG]. The whole argument above is built on a house of cards since the author bases a large part of the analysis on Nordborg, who in turn relies on Briske and Holechek. All of these people make the same error. So let me reiterate, holistic management (aka AMP management) and short duration grazing or rotational grazing are not the same thing. I didn't fully understand what holistic management was until I attended a few HM workshops and visited a few ranches using these management practices. Savory's talks and book weren't very useful since Savory's writing and speaking styles tends towards the use of a lot of run on sentences with non-parallel structure that tend to obfuscate rather than clarify. His TedTalk was one of his more persuasive talks since because of the time constraint, he was forced to be succinct. Though in this talk, many of the points, he’d normally qualify, were stated without any qualifications. Now most people think HM is just another way or system to move cattle. But HM (more specifically holistic grazing), is primarily a process to restore and regenerate land utilizing a holistic ecosystem view. Holistic grazing, also called adaptive grazing, should also be thought of as regenerative or ecological grazing. Holistic grazing mimics nature, regenerates land and restores ecosystem function. When starting with HM, the land’s existing conditions are assessed, goals are then determined, and a plan is implemented. That plan is constantly re-assessed and modified to achieve the plan's goals. Goals include improving soil health, greater plant and wildlife diversity, improved forage, improved animal welfare, improved hydrology, increased ground cover, etc. Ranchers using HM are as much soil farmers as they are meat producers. HM isn’t prescriptive. Movements are adapted to the land conditions. Every ranch will have its own unique plan to achieve its goals. Now systems like SDG and RG are systems, with specific movements patterns based on specific set timing irrespective of specific land conditions with the primary goal being cattle weight gains. With holistic grazing, ruminants are an essential tool for achieving these restorative and regenerative goals. Ruminants are "all-in-one" tools. They are mowers, seed pushers, ground "indentors", composters, fertilizer spreaders, nutrient cyclers and soil builders. Moreover these four-legged decomposing spreader nutrient cyclers, in the field, don't require any fossil fuels. Now the connection between grazing management and carbon sequestration is soil biology, specifically what practices improve biology and which one’s don’t improve biology. Soil biology drive carbon utilzation, respiration and sequestration as well as water infiltration and retention. As the most recent soil science has been finding when root mass is maintained, as I noted above, plants continue to exude exudates into the soil. When plants are grazed more than 50%, the plants lose most of their root mass. This is why cattle in HM or AMP systems have to be frequently moved. The tops of plants also have the most nutrition. Additionally when ruminants eat the tops, they are less exposed to worms and other potential pathogens closer to the soil. All the animal movements are based on field observations of plant growth and ground cover, not a specific pattern or timing as with SDG or RG systems. So once again, HM and SDG/RG are not the same thing. Cattle’s urine, manure and saliva function as inoculates that increase plant growth. Ruminants, including cattle’s ancestors’ auroch, co-evolved with vegetation in grassland ecosystems. Grasses have nodes, so when bit they regrow from those nodes. The manure in healthy grassland ecosystems is broken down quickly by different types of dung beetles that quickly move the dung into the earth and thus reduce any methane off gassing. This helps build soil. But the primary mechanism for building soil, again as I noted previously, is microbial necromass accumulation. Up until recently, the general belief was that top soil takes hundreds of year to accumulate through mineralization. MacArthur Fellow, and geologist Dr. David Montgomery in his last two books, The Hidden Half of Nature and Growing a Revolution, does an excellent job of dispelling this belief by illustrating how better soil conservation agricultural practices, including livestock integration, speed up top soil formation significantly. So, as I noted in my prior response, more soil accumulates and captures more carbon. There isn’t a finite amount of soil, so there isn’t a finite of carbon capture, thus the whole premise of “saturation” is a flawed one except for in a degenerated system where no more soil is accumulating. Better land management, including better grazing and agricultural practices, also maintain arbuscular mycorrhizal fungi [AMF] networks. When land is over grazed, tilled or treated with syn N, those AMF networks are destroyed. These networks connect plants and per preliminary research seem to play a huge role in the amount of carbon that can be sequestered. Dr. David Johnson, a microbiologist at New Mexico State University, did two self-financed research studies that showed massive increases in carbon sequestration coupled with decreased carbon respiration when fungi to bacteria ratios were improved. Johnson’s carbon sequestration numbers were 10 to 20 times those of Lal. Johnson’s numbers were so good, that one of the conservative peer reviewers didn’t believe those numbers, so both of Johnson’s paper were not accepted for publication. Though currently, several places across the globe including the new regenerative Ag program at Cal State Univ. Chico, are replicating Johnson’s studies to (hopefully) validate Johnson’s numbers. In the meantime, Johnson has made his composting methodology reading available online for anyone to replicate. This is a non-proprietary, non-licensed methodology, so Johnson doesn’t gain a dime directly from his processes. Here’s a good recent talk by Johnson at Cal St. Univ. –Chico where he discusses his research: Regenerating the Diversity of Life in Soils: Hope for Farming, Ranching and Climate. As noted in my blog entry on methane: Ruminations-Methane math and context. Spikes in atmospheric methane emissions correlate with industrialization, conventional natural gas use, and most recently fractured natural gas. From 1998 to 2007, atmospheric methane levels had leveled out. During this period of time, global cattle inventories increased. Since 2007, global cattle inventories have decreased yet atmospheric levels of CH4 have again started to rise. So there is NO correlation between global cattle inventories and atmospheric CH4 levels. What started in 2006? You betchya, fracking. Typical microbial sources of methane (methogenesis from archae- methanogens) have C12 isotopic signatures of methane while thermogenic sources of methane (fossil fuels) have C13 isotropic signatures of methane. But fracking and coal bed gas also have C12 isotopic signatures. This has led to some confusion in top down analysis of methane sources, especially when very rudimentary inventories of CH4 isotopes have been used. There's a lot of overlap in signatures, but in general some studies have been attributing CH4 to the animal Ag sector that should really be attributed to the natural gas fracking sector. (Note bottom up analysis of CH4 tends to over count and place blame on those sources of methane easier to extrapolate - like cattle- rather than sources of methane harder to account for like leaky gas pipes or the number of cockroaches). Red Baron @18, thanks again and I understand the fixed carbon and soil carbon distinction now, and I did already understand the general nature of the biochemical pathways. It's the quantities I struggle with. It appears Nordberg has 10% of the fixed carbon going into soil carbon and Jones has roughly 30 - 40% going into soil carbon, if I read things right. This would still seem to fall somewhat short of Savorys claims, but is obviously a pretty big improvement. That would be what is possibly significant. I'm out of my depth trying to compare findings of different studies that seem to measure things a bit differently. I think the writer of the article should address the issues and papers you quote. The reason for the dichotomy in numbers is for 2 reasons. The second pathway (LCP) was completely unknown until very recently. Glomalin wasn't even discovered until 1996 and it wasn't until several years after that when we began to understand its importance. Much of the literature simply omits it completely and much of the soils test data doesn't even sample deep enough to detect carbon sequestered that way. NPK fertilizers shut down AMF symbiosis. So even if it is known, there is a tendancy to believe it doesn't matter anyway because chemical fertilizers are required to keep yields up. This is wrong of course. Fertilizers are not required to keep yields up, if the LCP is fully functioning. This is not known by very many people though.